Liposomal drug formulations provide great opportunities of improving the drug efficacy and toxicity profiles. Drug molecules with amine groups such as doxorubicin, daunorubicin, topotecan and irinotecan etc. can be loaded by ammonium-based pH gradient. The Ready-to-load PEGylated HSPC Liposomes with Ammonium Sulfate (Catalog number PHPC100AS) are high quality PEGylated liposomes that are ready to load drug molecules containing amine groups. The drug loading process is completed in about 3 hours after mixing the drug with the liposomes. 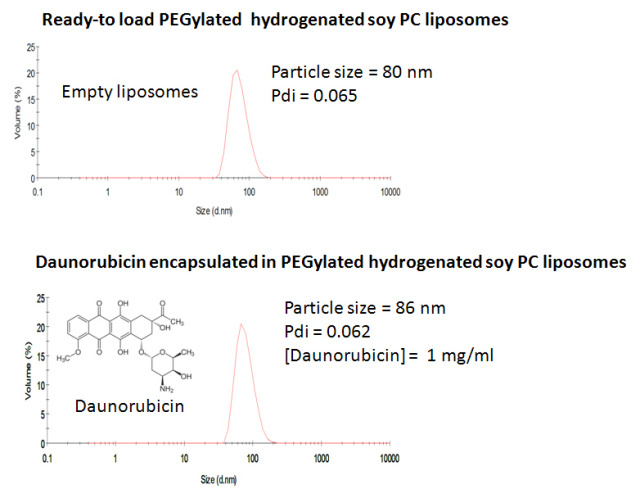 The composition of the liposomes is hydrogenated soy phosphocholine (HSPC), cholesterol and 18:0 PEG2000 PE (DSPE-PEG2000) in the weight ratio of 3:1:1. The total lipid concentration is 10 mg/ml. The liposomes are encapsulated with ammonium sulfate for drug remote loading. The average size of liposomes is about 80 nm with poly dispersity index (dpi) of below 0.1. The Ready-to-load PEGylated HSPC Liposomes with Ammonium Sulfate (Catalog number PHPC100AS) includes 10 ml liposomes with 10 mg/ml lipid concentration. The mass ratio of lipids is HSPC: cholesterol: DSPE-PEG2000 = 3:1:1. The concentration of ammonium sulfate encapsulated within the liposomes for drug loading is 200 mM. The buffer is 10 mM histidine, pH 6.5, 9.2 % sucrose. Liposomes are stored in a 2°C to 8°C refrigerator. DO NOT freeze liposomes.